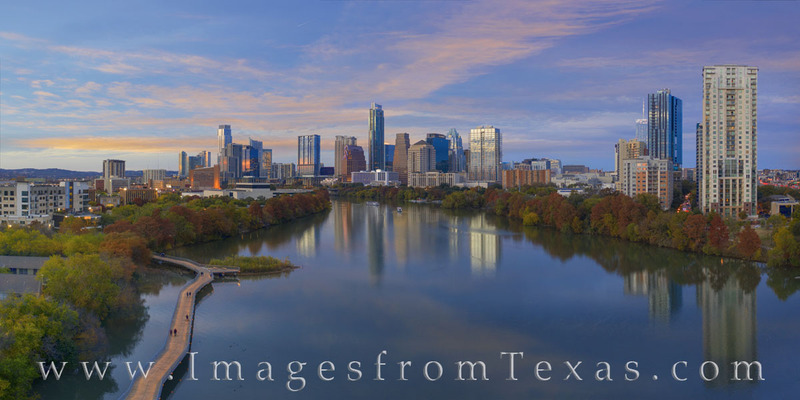 On a cool Novemembe evening high above Ladybird Lake, this aeriel photograph shows the colors of Autumn and the warm glow of sunset on the highrises downtown Austin. Featured prominently in this photograph are the Legacy at Town Lake (339’ - far right), the Austonian (683’ - center), and the tallest highrise, the Jenga Tower (officially the Independent - at 685’ - on the left). Photo © copyright by Rob Greebon.